Sole F63 Treadmill Review by Our Industry Experts! The Sole Fitness F63 Treadmill is On Sale! The Sole F63 treadmill is their entry level model and for years has been one of the best values at the $999 price range. For the money, this machine comes with some excellent features. In general, Sole treadmills are durable, tend to be low maintenance, and their customer service is responsive. 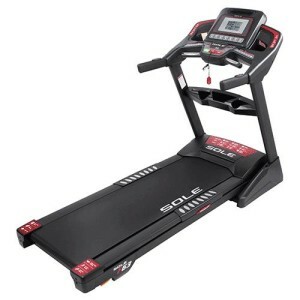 With the Sole F63 you are getting one of the most durable $999 treadmills on the market. It is ideal for walkers and joggers. The Sole F63 now comes with Bluetooth capability so you can track your workout stats on your smart device and monitor your progress towards your fitness goals. Simply download the Sole Fitness app and you are ready to go! 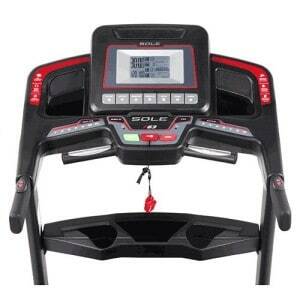 We are happy to see Sole Fitness entering into the world of fitness equipment stat tracking technology. The Sole F63 is priced at $999 with Free Shipping. Bluetooth Capability – The F63 treadmill now has Bluetooth capability so that you can track your workout stats on your smart device. Download the free Sole Fitness app or use any other compatible fitness tracking app to follow your stats and track progress towards your goals. 3.0 Continuous Duty HP Motor — This motor is sufficient for both walking and jogging. It comes with a lifetime motor, which suggests it seldom ever burns out. 20″ x 60″ Treadbelt — A sufficient length for walking and jogging. 253 Lbs. Weight — This is an above average weight for a treadmill at this price. This hefty weight will contribute to a stable and solid feel. 2.5″ Rollers — For the price, these are decent size rollers. Larger rollers reduce the wear and tear on the belt and the bearings. With larger rollers, you have less rotation and more contact between the belt and the roller. That means the belt has to revolve less. It also means less work for the bearings. Bearings are one of the components that burn out on a treadmill. Overall, the large rollers should extend the treadmill life. Noise Level — The F63 is not one of the quietest treadmills on the market, but what do you expect for $1,000? If you live in a second floor apartment, you may have issues with your downstairs neighbors. Speed and Incline Controls on Siderails — Some people may find this a minor feature, but we really like the ability to control the speed and incline without having to awkwardly lean over the console. Shock Absorption – Sole uses a different deck on the F63 than on their other models. The shock absorption is not quite as good, but is still a significant improvement over running outdoors. Console and Display – The console has a single window 6.5″ white LCD display that provides multiple feedback. It comes with six installed workout programs and two user-defined programs. There are also fans, speakers, and an MP3/iPod plug-in. The sound on the speakers is not the best. Warranty — As mentioned, the Sole F 63 has a lifetime warranty on the motor and frame. It also has 3-years on the deck / electronics / parts, and a 1-year labor warranty. At this price range, this tends to be above average. All other Sole treadmills come with a 5-year parts and 2-year labor warranty. Check Out a Full Comparison List of All Sole Treadmill Models Here. The most recent version has Bluetooth capability which allows you to track your workout stats on you smart device with a compatible fitness app. We like that this machine now has improved workout stat tracking technology like many other treadmill brands. At $1,000, the Sole F63 is a worthy competitor overall. However, there is some serious competition at this price range. Regardless, with the F63 you are getting the Sole reputation for quality and value. 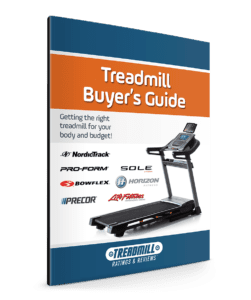 At first glance, the savings of $500 in comparison to their popular Sole F80 treadmill may be attractive, but you are compromising on the deck, motor, rollers, warranty, and display. Also, you do not get heart rate control with the lower model. Determine your level of activity and decide if a budget treadmill is the best choice. We would recommend the Sole F63 for walking and light jogging, but if you plan to run or jog regularly, we suggest the Sole F80. I’ve had my treadmill for about a month, and so far I have absolutely no buyer’s remorse at all! I don’t know how it would be as a running treadmill, since I only use it for walking and use the incline to make the workout more intense. I paid the extra $ to have the delivery people set it up. They got here when they said they would and set it up perfectly — no complaints there! I’m having a lot of fun with my new toy and getting fitter besides. Even the MP3 player speakers work better than I expected. BTW, although I’m a female under five feet tall I have no trouble lifting up the treadmill to fold it as long as I use proper lifting technique. Thanks for your great reviews. My wife and I took them strongly into consideration when buying our treadmill. In the end we were debating between the Spirit XT175 (on sale for $999.99) and the Sole F63 (on sale for $999.99). He (Salesman) actually recommended the F63 for light running and jogging over the Spirit XT175, because of the longer deck on the F63. After using the F63, we are very pleased with our purchase, I am convinced it is the one of the best for under $1,000… Thanks again for your GREAT reviews!! *This Sole F63 Treadmill Review is based on not only testing the equipment, but also comments, testimonials, reviews and ratings of customers and third parties. We attempt to be as accurate as possible. Warranties, components and prices can change without notice. Does this treadmill have the ability to descend when running, such as -0.5, – 1.0 etc, allowing for interval training, and running downhill? This machine does not do a negative incline. Does the deck require lubercation from time to time. Or is it maintenance free? The F63 does not have a wax infused belt (most consumer brands will not). Therefore you will have to lubricate but it depends on usage. If your notice the belt is sluggish or sticking then it’s time to lubricate. There are some commercial machines which feature a wax infused belt that will not require lubricant, but pricing is generally much higher. How long is the electrical cord. Need to know it needs to face the wall or can it be turned towards the center of the room. Where is the Sole treadmill manufactured? Hi Ed, user weight limit on the Sole F63 is listed at 325 lbs max. IFIT is a technology exclusively for NordicTrack and not related to Sole, nor available on Sole Treadmills. Hi Ken, for a serious runner you should look at the Sole F80. I know Sole says lifetime warranty on motors and frame, but what about the walking belt? How long is the warranty on the walking belt. if any? The belts typically do not wear out as long as you add the necessary lube to them as shown in the owner’s manual. Hi I have had my Sole F63 since 2013. I love it, but recently it has been having issues. it stops in the middle of a workout and LSI comes up on the display. We have cleaned it, readjusted the sensor and lubed the moving parts. Still it keeps happening. What else can we check? there is not a whole lot of information in the manual. Help! !